The Shuffler Celebrates Their 16th Year of Keeping Shufflers Informed, of Increasing Interest in Shuffleboard!! Stan McCormack. 2018 11 16. 6 Responses to The Shuffler Celebrates Their 16th Year of Keeping Shufflers Informed, of Increasing Interest in Shuffleboard!! Happy Anniversary to the Shuffler, a great read indeed. 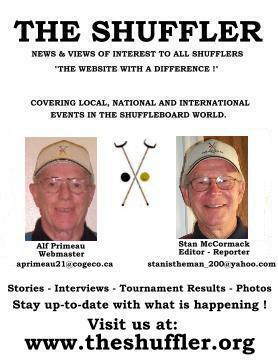 Keeps everyone updated on events, as well as letting us be aware of our friends from all avenues of shuffleboard, no one really knows the hours spent doing this, and no one could replace the author either. “Congratulations “ to the Shuffler. Your work is very much appreciated by many people from around the world. You are doing an amazing job of promoting “Shuffleboard” and keeping us updated on events etc.